Die I 1d, 6d, 9d, 1/-, 1/6d, 2/-. Die II 3d, 6d, 1/-. DieI 1d R4, 6d R4, 9d, 1/-. - plus 1/6d & 2/- [manuscript SPECIMEN] both R4. DieII 3d R4, 6d R4, 1/- R4. - plus 3d & 6d, [manuscript SPECIMEN] bothR4. Background: Queensland Government Railways started in 1865 with the original Bigge's Camp (later renamed Granchester) to Ipswich line, eventually growing into a system that now covers over 10,000 route kilometres and represents Australia’s largest rail and transport network. At its beginning the Queensland Government Railways chose to adopt a narrow guage of just 4 ft 8 1⁄2 in. as this was seen as a way to build low cost railways that best suited the topography of Queensland. Narrower gauge railways require less earth to be removed from hills and mountains during construction. These original light and cheap railways were designed for operation at only 15 mph or 20 mph. The choice of the non-standard narrow gauge was controversial but despite a desire to standardise rail networks in the Colonies the narrow gauge was also adopted in Tasmania and Western Australia. The rail network expanded quickly up until the end of the 1800’s but later growth was limited as road transport grew. A railway up the coast and three inland routes provide a backbone to the state's rail network. Numerous branch lines, some now closed, once serviced remote areas and continue providing transport to local industries, particularly mining. Device: The device was made by Slopers in the late 1880’s and it is only found on the railway stamps of Queensland for a short period in early 1890’s. It is a single head device. 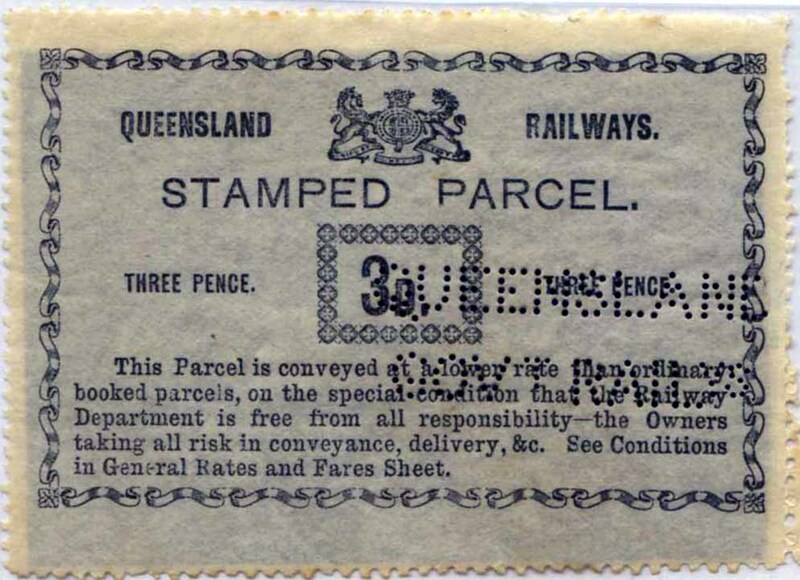 It is a large pattern and well suited to the large Queensland Railway parcel stamps of the period which were oblong and approximately 90 mm wide and 65 mm high. It is found on both the 1880 and the later 1885 versions of these stamps. Previous published references have featured a distorted image but this would provide little confusion as the size and style of the pattern is unique. Of more concern was the rating of “scarce” that was previously assigned to this pattern. This is most inappropriate as the railway stamps themselves are very rare and the perforated versions are even rarer. The rarity of the pattern was further effected by the short period of use as a new smaller range of railway stamps were introduced in 1892 and the pattern was far to large to be used on these stamps.